The college division began in 1984 and has grown to include more than 18,000 student-athletes across 800+ college teams, making it USA Ultimate's largest member segment. In 2010, the division implemented a formalized regular season, and ran its first ever Division III College Championships. The College Championships have been streamed lived on ESPN3 with follow-up broadcasts on ESPNU in each of the last five years. In 2017, the College Championships were live on ESPNU for the first time. Tournament Sanctioning - information on how to host a college regular season tournament. Championship Events - information on how to submit a bid to host post season events. Registar Verified Rosters Due 5pm MT, Friday, March 1, 2019. For additional resources to assist you with your college team visit our college development page. Below will be a list of USA Ultimate regular season sanctioned events during January 2019. Contact sanctioning@usaultimate.org with any questions regarding event sanctioning. Below will be a list of USA Ultimate regular season sanctioned events during February 2019. Contact sanctioning@usaultimate.org with any questions regarding event sanctioning. Below will be a list of USA Ultimate regular season sanctioned events during March 2019. Contact sanctioning@usaultimate.org with any questions regarding event sanctioning. Below will be a list of Conference Championships for the 2019 USA Ultimate post-season. If you have a question on your Conference or Regional event, please contact your college coordinator. Below will be a list of Regional Championships for the 2019 USA Ultimate post-season. The 2019 Division-I College Championships will take place May 24-27, in Round Rock, Texas. The 2019 Division-III College Championships will take place May 18-19 in College Station, Texas. 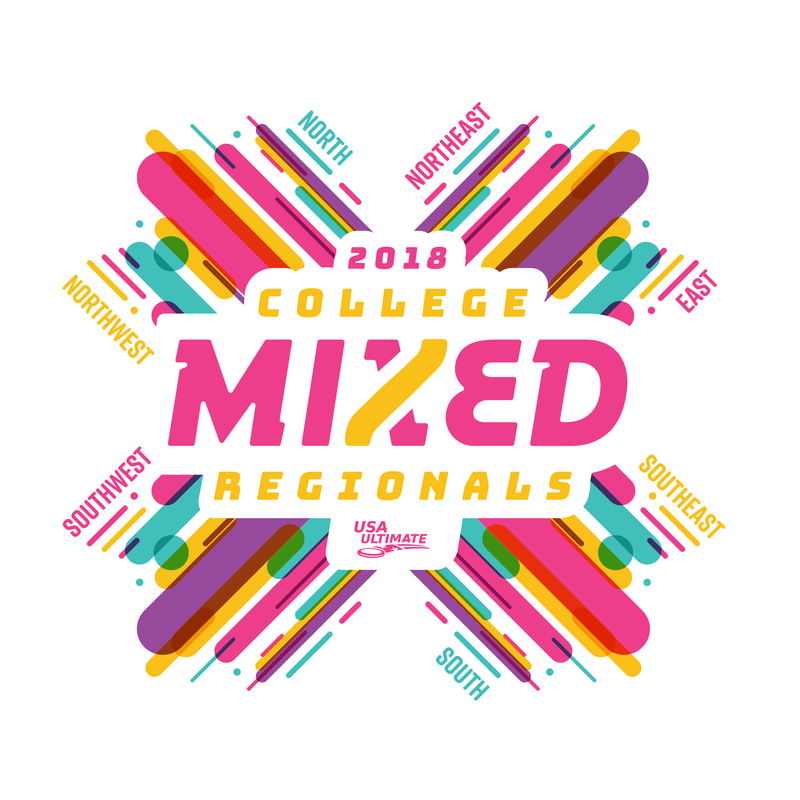 2018 College Mixed Guidelines information can be found HERE. Minimum games for inclusion at this point in the season is 10. The maps below include any known college teams that have competed in the past 5 + years. Please report any geocoding or information errors to webmaster@usaultimate.org. As teams register for the 2019 College Series, we'll use these maps, along with the roster log list, to indicate a team's roster status. College teams compete in one of 10 geographic regions of play. Each region is broken out futher into conferences, each with a competition division and geographic scope. The tabs below detail the breakdown of conferences within each region. For information on a team's conference assignment, click on the team in the map above. In the absence of D-III Conferences, all D-III teams will be included in their respective D-I Conference/Region. Bids to D-III College Championships will be allotted based upon the Regular Season Rankings, with the automatic bid going to the team with the highest end of season ranking. The College Division is limited to individuals who meet both the academic and participation eligibility requirements. Where does my school play? Figure out which of the 10 regions your team is in. Who are my local coordinators? Visit the Contact Us page for the full list of volunteer college coordinators and their email aliases. How can I register to play? Read the 2018 College Guidelines for the competition rules pertaining to the upcoming season. Take a look at these resources to help you developing a college program. You can also contact our National Developmental College Coordinator to get help with your particular situation.